Our Code: PEPL-81. We will always help you to have a 100% positive happy buying experience. Part Number: PL-81. PECO SL-8352 Wooden Sleeper Code 83 #5 Radius (660mm) Insulfrog Left Hand H0 Point T48Po. PECO SL-8352 - 1 x LEFT HAND #5 RADIUS (660mm - 26") INSULFROG POINT 'H0' GAUGE - WOODEN SLEEPER CODE 83 FINE SCALE RAIL -. PECO SL-U8364 Wooden Sleeper Code 83 #6 Diamond Crossing H0 Unifrog. 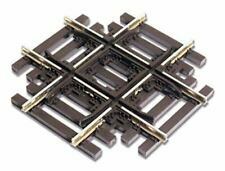 PECO SL-U8364 - 1 x #6 RADIUS UNIFROG DIAMOND CROSSING 'H0' GAUGE - WOODEN SLEEPER CODE 83 FINE SCALE RAIL -. 305.7mm LONG - CROSSING ANGLE 9.5'. 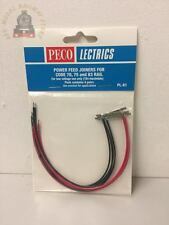 Peco SL-8381 Streamline Insulfrog #8 Right Hand Turnout. Code 83 HO Gauge. PECO IL-83 - 6 x 36" (914mm) LENGTHS NICKEL SILVER FLAT BOTTOM RAIL CODE 83 RAIL - 36"/914mm Long. PECO FISHPLATES WILL BE NEEDED TO JOIN THESE. WIDTH at RAIL BASE = 1.72mm. WIDTH at RAIL HEAD = 0.78mm. PECO SL-8351 Wooden Sleeper Code 83 #5 Radius (660mm) Insulfrog Right Hand H0 Point T48Po. PECO SL-8351 - 1 x RIGHT HAND #5 RADIUS (660mm - 26") INSULFROG POINT 'H0' GAUGE - WOODEN SLEEPER CODE 83 FINE SCALE RAIL -. PECO SL-E8361 - 1 x RIGHT HAND #6 RADIUS (1092mm - 43") ELECTROFROG POINT 'H0' GAUGE - WOODEN SLEEPER CODE 83 FINE SCALE RAIL -. 223.5mm LONG - CROSSING ANGLE 9.5'. Add to Favourites. PECO SL-8362 Wooden Sleeper Code 83 #6 Radius (1092mm) Insulfrog Left Hand H0 Point T48Po. PECO SL-8362 - 1 x LEFT HAND #6 RADIUS (1092mm - 43") INSULFROG POINT 'H0' GAUGE - WOODEN SLEEPER CODE 83 FINE SCALE RAIL -.